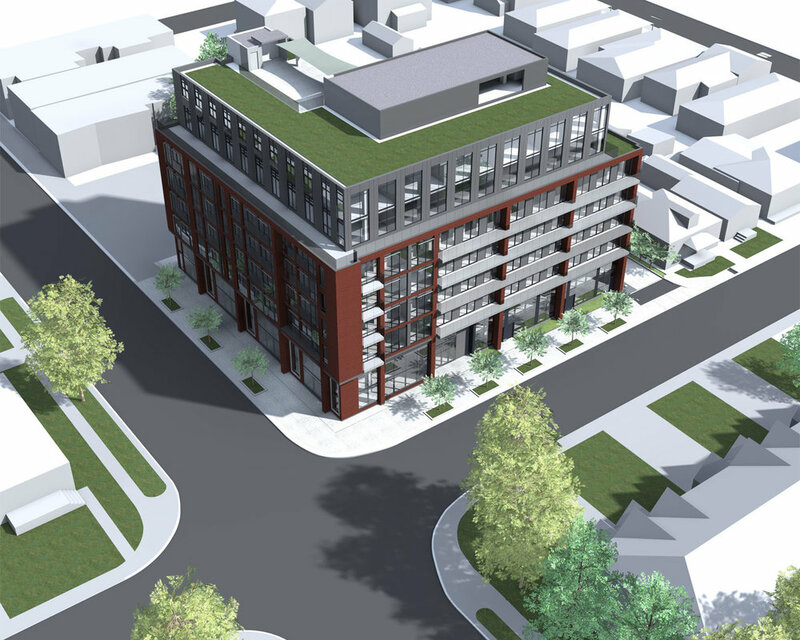 John van Nostrand Developments (JvN/d) is proposing to redevelop the properties located at 468-476 James Street North in the form of an eight-storey, mixed use condominium, introducing a new approach to flexible design and inclusionary home ownership in Hamilton’s North End neighbourhood. Through an innovative, participatory approach to financing, design, and development, the development proposal has been prepared in close collaboration with the neighbourhood and future residents of the new condominium residence. SvN Architects + Planners is the planning consultant for John van Nostrand Developments Inc. (JvN/d), the applicant. OfficeARCHITECTURE is the Architect for the development of the project. As house prices rise out of pace with wages, the dream of homeownership feels out of reach for a growing number of Canadians. Led by John van Nostrand, JvN/d is a housing development company that aims to reduce the minimum annual income required to own a home from upwards of $100,000 down to $25,000, thereby opening the door to homeownership to more Hamiltonians. JvN/d's innovative approach to development allows prospective homeowners to have greater involvement in the planning, design, financing and construction of their homes. To permit the proposed development, JvN/d has applied for an Official Plan and Zoning By-Law Amendment to bring the site's planning permissions into conformity with Provincial and City density targets as well as Municipal policy and zoning objectives, in order to deliver inclusionary homeownership in a transit-supportive built-form, which helps to contribute to the development of a complete community in Hamilton's North End. The proposed development will consist of retail and/or community space on the Ground Floor along James Street North, along with grade-related residential and/or live-work uses on Ferrie Street. The first two levels on both James and Ferrie Streets are provided with additional setbacks in order to allow for generous pedestrian boulevards on both streets. Upper levels will consist of residential uses with an indoor amenity area located on the Second Floor. The development comprises a proposed maximum of 91 residential units. It provides owners with the ability to purchase multiple “lots” (i.e. bays) to create varying floor areas ranging from 250 to 1,000 square feet in order to create a Studio or 1-, 2- or 3-bedroom unit of their choice. Owners can also customize the internal configuration of their unit – and then alter it in the future as their family size or composition fluctuates over time. A total of 41 parking spaces will be accommodated in the rear courtyard and on a single level of underground parking consisting of twenty-nine (29) resident spaces, two (2) car-share spaces, and nine (9) visitor spaces. An external loading area is provided at Ground Floor. Both the loading and parking areas are accessed from a driveway off Ferrie Street. Secure long-term bicycle parking for residents will be located in the Rear Courtyard while short-term bicycle parking spaces are proposed in the boulevard areas in front of the building. All of the development application materials submitted to City of Hamilton Planning Staff can be found via the links below. The development will address an important gap in Hamilton's housing market by providing high quality, financially accessible homes to households earning $25,000 per year and up. The development builds on lessons learned from the traditional building practices of 19th century owner-built homes in Canada, including several neighbourhoods in Hamilton's West Harbour. It adapts these to a contemporary mid-rise condominium residence that will provide owners with the flexibility to customize and adapt their homes to suit their evolving household needs over time. For example, homeowners will have the option to manage the completion of the construction of their homes; to rent out part of their units to generate additional income; to subdivide their units to accommodate aging parents or adult children; and, to purchase more space, or sell part of their own space, to adjacent owners as their households expand or shrink over time. In keeping with the historic character of James Street North, brick columns highlight the main retail frontage. As the building turns the corner, onto Ferrie Street, the horizontal lines of the balconies help to accentuate the transition in scale to adjacent, existing lower density housing along the side street. The proposed building will include green roofs and outdoor patio spaces to help insulate the building and to retain and re-use a significant amount of rainwater that would otherwise overflow into the storm sewer system. Rooftop and balcony planting beds will provide opportunities for growing food and flowers. The development approach represents a shift in the conventional system of real estate investment by ensuring that local residents, the community, and homeowners are able to participate in, and benefit from, local development. By recognizing the value of sweat equity (i.e. contributing value enhancing improvements through a homeowner’s efforts and labour), and equipping residents with opportunities to develop personal economies through homeownership, this project is intended to provide a new model that allows more households to own, particularly those with low and moderate incomes. It aims to respond to the housing needs of the community by providing local residents with the opportunity to access homeownership and long-term housing security in their neighbourhood. Development projects often accelerate neighbourhood change and the displacement of existing lower-income households. This project aims to intervene in this process, in order to mitigate displacement. This proposal has been informed by extensive community consultation, through door-to-door neighbourhood surveys, multiple presentations to the North End Neighbours Association, monthly neighbourhood meetings, weekly drop-in office hours, and ongoing communications through the project website, newsletter, and social media. While improving the physical environment and addressing emerging planning regulations are essential to the evolution of this proposal, an acknowledgement of the relationship between planning, architecture, development, and socioeconomic outcomes and conditions lies at the core of the project. The architectural design of the building and accompanying down payment financing program were developed in close collaboration with local residents through conversations about their housing needs, their financial capabilities, and their fears about displacement. This proposal builds on local histories, responds to current needs, and supports the future growth of the North End community in ways that are inclusive and respectful. Located at the corner of James St. North and Ferrie Street, in Hamilton's North End community, 468 James Street North offers new model for home ownership. Juliet balconies are provided for residents fronting James Street North on the 2nd-6th floors while conventional balconies are provide to residents fronting Ferrie Street and for units located on the 7th and 8th floors. The proposed building is comprised of three main elements: active street related uses at its base; conventional residential uses in the middle mass of the building; and potential loft like residences and green roof gardens up top. The design of each element of the building has a distinct purpose and is informed by a specific logic. Community consultation and co-creation are intrinsic to the JvN/d approach to development. To date JvN/d has knocked on over 1380 doors in the neighbourhood to solicit feedback from North End residents, given multiple presentations to the North End Neighbours Association, held monthly neighbourhood meetings and weekly drop-in hours at the JvN/d community hub, and provided updates on the progress of the development through the project website, newsletter, and social media. In addition to these external outreach and engagement activities, JvN/d have also conducted 30+ one-on-one, in-depth interviews with prospective owners and interested community members. We invite you to review the planning application documents listed above and look forward to reading your feedback. The public participation process is a legislated requirement for any development application as outlined in the Ontario Planning Act, R.S.O., c. P.13.